Synopsis from Goodreads: When you can’t trust yourself, who can you believe? ANDIIII!!! I finally read it!!! And now I’m going to tell you all what Andi told me: READ THE BOOK. You will not regret it! 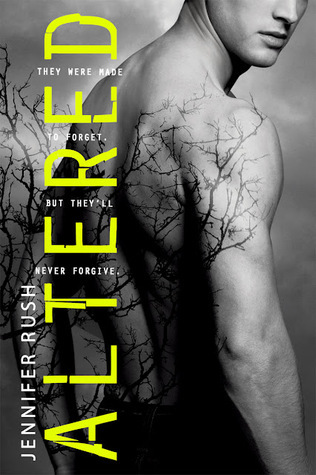 I would never have guessed that Altered is a debut novel, and let me tell you – if this is where Rush is starting, I can’t wait to see where she goes! She’s definitely going on my “to watch” author list. I loved every bit of this book, from the characters to the plot to the concept – it’s all perfect! Anyway… Anna is capable, intelligent, and can take charge when the need arises. I really love her character, and hope she develops even more in the next book. The Boys: Okay, I’m going to put them all together since breaking them down one by one would take up far too much text since I could just go on and on about each of them. Sam, as the leader of the four, is the most mature and taciturn, and seems to be the pillar for all of them. He’s strong and capable, and he and Anna were the perfect team as they tried to figure everything out. Did I mention his tattoos? Cas is the goofy, slightly more childish of the bunch, and yet I still fell in love with him. He’s not immature, but just a little more carefree. When the time comes for him to be responsible, he steps up. Nick is my favorite of the four, even if I think his backstory was a bit transparent. He’s the dark and moody one, but as the book progresses he opens up a bit more, and shows a softer side. Definitely the most complex out of the four. Trev… Trevor!!! I love him. He was my first love in the book, with his bookish ways and soft heart and easy friendship with Anna. But by the end of the book… Grrr. I really hope we see more of him in the next book, because he needs to be redeemed in my eyes. Concept: I love the idea of genetic manipulation – the possibilities, the ethical implications, the ideas of free will and being human – all of it! I’ve even written about it in my own novels (and I’m still hoping to one day share it with someone!). And here’s where my one complaint for the book is: I wish there was more world building. I know that the boys were altered, but how? And why? And what specifically was done to them? There were a lot of questions about the actual genetic manipulation that weren’t answered for me, so I’m hoping they’re answered in the second book when the group explores their pasts more. Plot: I loved it! It was nearly perfectly paced, up until the very end where I felt it was a tiny bit rushed and wrapped up too quickly. Other than that, everything was flawless. The romance never overpowered the action, and vice versa. Plus, the romance, other than being a teensy bit insta-lovey and angsty on Anna’s part, was really well written. AND THE PLOT TWISTS! YES – twists, as in more than one. Jaw dropping/screaming from shock in several places. I’m beyond excited for the next book, and really hope I have a lot more questions answered in Erased! And I feel super special, because I won a giveaway from Andi (which was the incident that actually got us to talking) and she’s pre-ordered me a copy of Erased! So come January ish I’ll be reading the next book in this promising series! Who was your favorite out of the four boys? Do you think the plot was a bit rushed at the end, or did you like that it skipped the unnecessary planning and drama? Why haven’t you picked up this book?? Do you think large character casts like this can be overwhelming, or do you prefer having several protagonists? ACH!!! I’m so excited!!!! NICK AHHH FEELS he’s my baby 1000%. And I’m also super jealous that you’ve already read Erased but I will wait patiently for my copy when it comes in January! Less than 60 days now!